After slowing down in Chengdu and especially Kunming, the final leg went by in a whirlwind. We had flights on three straight days – from Kunming to Hangzhou to Beijing and then back home. This post is being written somewhere over the Sino-Siberia border with another eight hours or so to go in the flight to Boston. (Instead of across the Pacific, the flight actually goes to the US over the Arctic and Canada). We landed in Hangzhou in the wee hours of Sunday morning. After sunshine and shortsleeves in Kunming, we stepped off the plane to a snowy, slushy mess. Snow in Hangzhou is apparently like snow in Atlanta (you can see the flowers in bloom below), and I guess we brought enough New Englanders to make it happen. Our schedule left us only as much of Sunday morning that we did not want to sleep through to see the city, so we were largely on our own. I woke up reasonably early to find that the breakfast at the hotel was on a 32nd floor restaurant, built in the round with panoramic glass windows that allowed a stunning whitecap view of the city’s famous Westlake and canal along with its vibrant new architecture. After the meal, which starred a delightful green tea cake that had a plum filling and a toasted sesame crust, I bundled up to walk through nearby Wulin Square and its open plaza. You can see the pictures below. After about a half hour, to my surprise, I spotted a cross on the top of a building off a side street about four blocks from our hotel. I found a Protestant Church in mid-Sunday service. As I strolled in and blessed myself, an usher was about to show me to a seat when another greeter approached and asked, in perfect English, “Are you Catholic?” Answering yes, she proceeded to give me directions to the local Catholic Church, which was only 200 more meters down the road. I arrived to find the doors wide open and not a seat available. The Deacon had just finished blessing the very devout congregation with incense. A red-sashed usher directed me to stand in the corner and I stayed for the Liturgy of the Eucharist in China! To fully appreciate this, the Catholic Church has had an historically uneasy relationship with Communist China. The government has not actively suppressed Catholicism as it has other traditions in recognition of its long-standing history. Jesuit missionaries go back centuries to St. Matteo Ricci, the first Westerner permitted inside the Forbidden City. However, the government has clashed with the Vatican at times because it wanted the right to approve Church officials in China, which of course, the Pope refused to cede. Thus, for part of the 20th century, you could find an official and an underground Catholic Church, which “simply” differed in its deference to the Holy See. 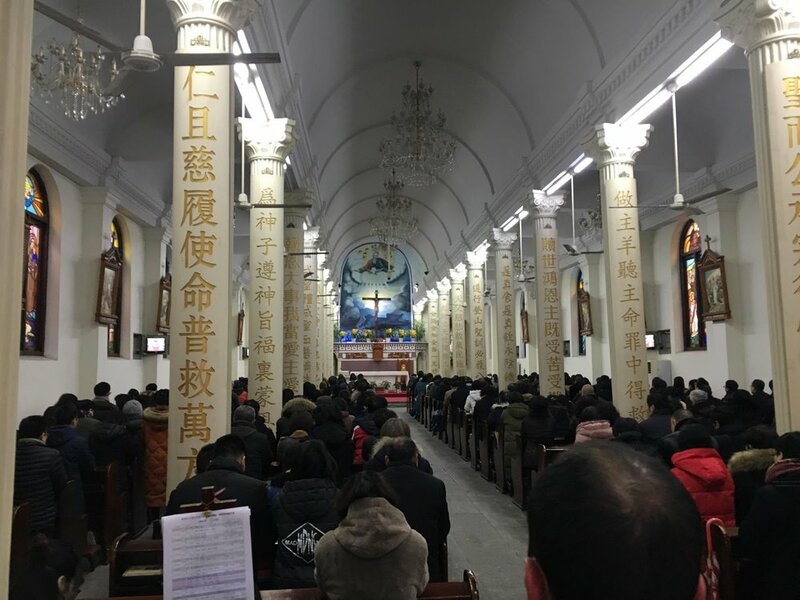 Yet, as a sign of the opening up of Chinese society, here was a congregation filled with families and a few religious sisters practicing out in the open in a gorgeous little Church, complete with stained glass windows of the saints, one of whom was John Paul II. 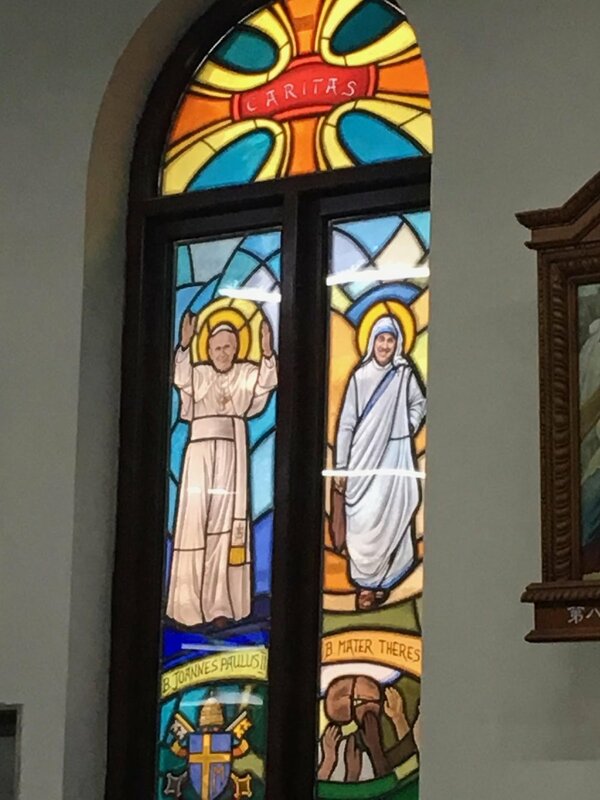 Seeing both the window and a separate icon of St. John Paull II assuaged any concerns that I might have had over Papal authority and it left me free to sing along with pipe-organ hymns (which though they were in Chinese, were basically transliterated versions of the classics). I did not pass up the opportunity to receive Communion. And to think, this happened because a stranger had the insight and the kindness to ask if I was Catholic and directed me to a Church that was not her own. The Holy Spirit never ceases to amaze. After Mass, everybody stayed and knelt to pray what I gather was a Hail Mary. The afternoon brought our final trip to an agency. This agency truly rolled out the red or should I say green) carpet having posters made of our bios, signs with our school name—even a decal for the floor. If you check the pictures to the left, I had the chance to take a selfie with myself. I also had one of the funniest exchanges with a student, dressed in an oversized jacket with New York “Supreme” license plates all over. In describing our programs, I mentioned that “Our job as a school is to serve our students.” He responded, “Don’t say serve – you don’t serve us, you help us.” I exchanged contact information with him on WeChat because I truly hope he applies. After this visit, there was nothing left but to make our way back to Beijing, say our goodbyes, and prepare for this long flight home. I cannot thank Ivy International and their representative, Berlin Wu and Diana Ryan for giving us this magnificent experience. Yes, this is part of a working partnership, but the two of them – Berlin in particular – went out of their way to show us hospitality and make everything run on time. Berlin was responsible for all of the logistics on this trip, down to ordering all of our meals for us. He needed the patience of Job to steer this rambunctious group of educators through five different Chinese cities in twelve days. I also want to thank my fellow educators on this trip. All of us work for mission-driven schools and we bonded instantly in the best tradition of good people seeking common purpose in the service of others. Simply being with this group of people over the course of nearly two weeks was ongoing mutual professional development and spiritual nourishment. Lastly, throughout this trip, all of our group was continually astounded by how friendly and willing to help the Chinese people we encountered were. None of us spoke any Mandarin besides us mispronouncing Ni hao (“hello”) and shi shi (“thank you”). Yes, at every turn, they tried to find a way to accommodate us even if it was through sign language. We all watch the news and see the occasional bluster between the leaders of our countries. At our level, we found none of it, just a people sharing their homeland with visitors (and occasionally wanting to take a picture with the Americans). 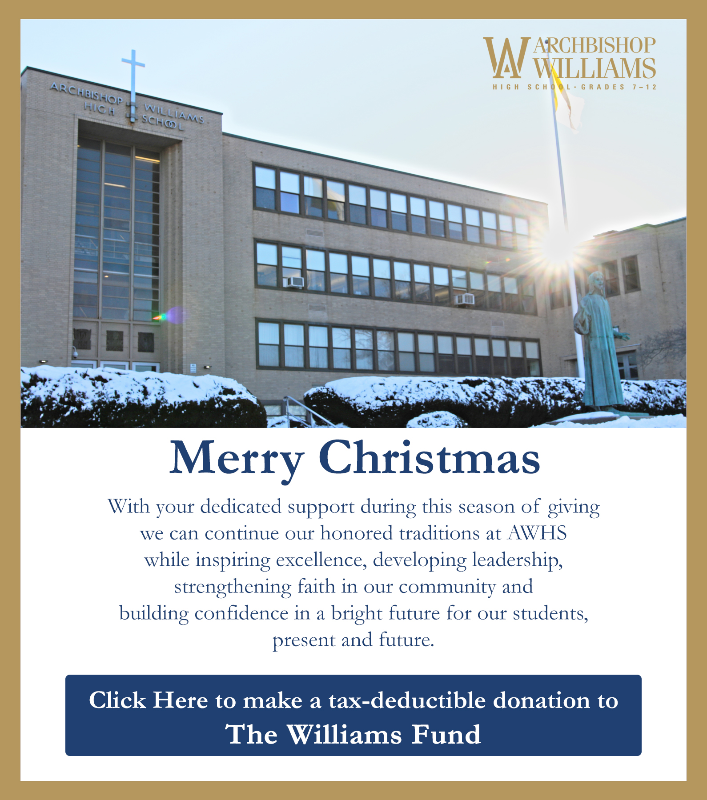 It’s been fun sharing these experiences with you, the Archbishop Williams community. For those that have taken the time to read it thank you (and thank you for your forbearance with the lack of proofreading on some of these entries, many of which were written at odd hours). I hope you found it worthwhile. The love of Christ truly drives us on all over the world.